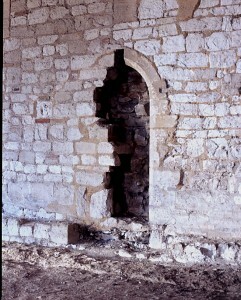 The Nun’s Refectory was a dining room built in the 14th century (1350) by the Countess of Pembroke for the Fransican nuns, known as the Poor Clares. This impressive building revealed an almost complete Medieval tiled floor during the 1980s. 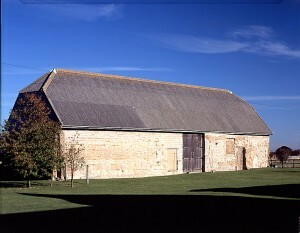 It’s long term survival was due to its later use as a barn used to house grain and then cows until the 1950s. Between about 1830 and 1854 Denny Abbey was leased to the Witt family. John George Witt was born in 1836 and lived in the Abbey until the age of 14. He recalled the Irish peasants who came to reap corn at Denny, bringing with them their wives, children and sickles. They lived on bread, milk and potatoes. They cooked outside and slept in the barns. At a wake held in the refectory in honour of a child who had died he describes ‘figures dancing to the music of a fiddle and yelling in the twilight, illuminated by tall candles set in the walls”.